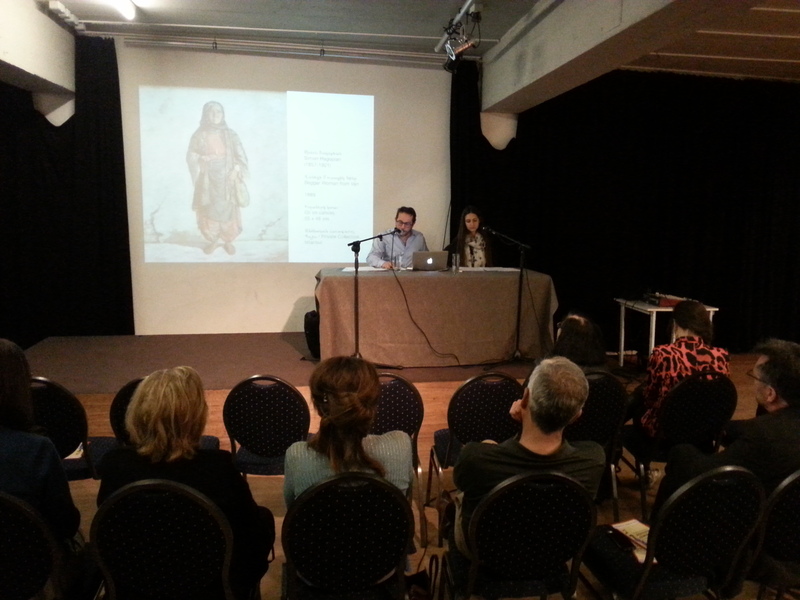 This year saw the Programme of Armenian Studies make its first appearance outside London, with a lecture at the Centre Arménien Hay Doun in Brussels. In his opening remarks, Dr Krikor Moskofian, Director of the Programme of Armenian Studies, welcomed the audience and expressed his pleasure that a new chapter had been started for the Programme of Armenian Studies, this being the first event outside of London. Moskofian continued by introducing the aims of the Programme: its first, the teaching of the Western Armenian language; its second, the propagation of Armenian studies in academic circles, both in London and in cities across Europe. Moskofian noted that the Programme was not imbued with any political aims, but that its objectives were motivated by the desire to preserve and promote Armenian studies within academia. He then introduced the speaker of the event, Vazken Khatchig Davidian, a PhD candidate in Art History at Birkbeck College, University of London, who was giving his first lecture in Western Armenian. Davidian’s academic research is connected to the heritage of Armenian art, and the subject of his thesis engages with Realism and Armenian artists of the Ottoman Empire in the late 19th century. Moskofian concluded his opening speech by expressing his gratitude to Andre Gumushjian and to all the members of the Centre Arménien, including the evening’s interpreters Sarin Aslanian and Movses Der Kevorkian, who provided simultaneous interpretation from Armenian into French, and especially to Shogher Margossian, member of the Centre Arménien, thanks to whom the event was able to take place. The title of Davidian’s lecture was “Perceptions of the Migrant (պանդուխտ) from Armenia in Late 19th century Constantinople”. Davidian commenced with the presentation of an excerpt from Hagop Baronian’s Honourable Beggars, a well-known work of literature that satyrizes Armenian life in late nineteenth century Constantinople, alongside a photographic image of four hamals (porters) on Galata Bridge and a painting by the neglected Ottoman Armenian painter Simon Hagopian (1857-1921), executed some two or three decades after the publication of Baronian’s text, depicting four migrant hamals at rest on the same bridge. These written and visual artistic works were presented in a complementary way, and formed an important tool in the attempt to understand and reconstruct various historical contexts such as that of the Ottoman Armenian experience. Davidian also discussed the difficulties faced by the art historian of finding and locating such paintings and images, noting that such works are normally found in private homes, rather than the public collections of established institutions. The reality of the migrant worker from Ottoman Armenia in Constantinople was a central concern of the city’s Armenian press and literature in the late nineteenth century. This is unsurprising as, according to some estimates, there were around 80-90,000 Armenian migrants in the city in 1895, marking a dramatic increase when compared to a figure of only 15,000 in 1860. While Armenians were not the only group who migrated in large numbers to the Ottoman capital in search of work, and not all Armenian migrants hailed from the Ottoman East, the city’s Armenian press mostly viewed the specific emigration from Ottoman Armenia as a major and unfortunate problem. Numerous newspaper editorials and articles of the time focused on the discussion of impoverished peasants from Armenia who had come to work in Constantinople in order to provide for their families back home. Many took jobs as hamals, like the men in Hagopian’s painting, living in slum-like conditions and organised into guilds (esnaf) in order to protect their interests. The vast majority of these men hailed from the rural regions of Van-Vasbouragan, and Mush-Daron in Ottoman Armenia. Davidian noted that interest in these migrants was multi-faceted, and often ethnographic, presenting as an example a watercolour painting by the Constantinople resident and art teacher Pietro Bello (1831-1909) which depicts a group of Armenian hamals celebrating Merelots (Remembrance Day of the Dead) by dancing and playing music in an Armenian cemetery in Pera. While for many nineteenth century intellectuals, emigration from Ottoman Armenia was viewed negatively as a sign of the depopulation of Armenia, the perceptions of an earlier group of intellectuals influenced by Romanticism were different. A typical example of the romantic and quasi-religious prism through which they perceived migrants was Mardiros Khachmerian’s book The Life of Armenian Migrants, published in Constantinople in 1876. Khachmerian divides the migrants into three categories: the first type are those who emigrate, work hard and send their earnings to their families, and eventually return home; the second type finds it difficult to adjust in the new environment, is taken advantage of and is unable to make enough of a livelihood to return home; finally, the third type forgets family and homeland, and vanishes. Davidian argued that the presence of the famous image of ‘Mother Armenia Among the Ruins’, conceived by the Italian artist Michele Fanoli (1807-1876) commissioned by the Mechitarist Order, on the cover of Khachmerian’s book captures the essence of the book: hence ‘Armenia’ calls for her children that have abandoned her to return to the homeland and toil to make it flourish and regain her imagined ancient splendour. Until the mid-1890s, the subject of Armenian migrants was the most commonly discussed issue in the Constantinople Armenian press. French Realism had an immense influence on the Armenian media’s secularised perception of the migrants, especially evident in reformist newspapers such as Arevelk (Orient), Masis (Ararat), Yergrakount (Globe) and Hayrenik (Fatherland). Emphasis was placed on offering solutions to the migrants’ problems ranging from aid to the development of the economy of Ottoman Armenia, with education accepted as a universal panacea. The Realists of Constantinople mostly focused on the experience of the migrant worker in the city. The influential author, activist and editor of Arevelk and Masis, and later Hayrenik, Arpiar Arpiarian (1851-1908), the godfather of Western Armenian Realism, was central in the project of presenting “life as it is”, which also applied to the life of the migrants. The writer who engaged with the realities of the migrants most deeply was Hrant (Melkon Gurdjian, 1859-1915). Hrant was a relentless critic of the disregard to which the migrant was subjected by the urban Armenians of Constantinople in a series of articles and essays known collectively as Letters of the Migrants. Yet empathy with the lot of the migrant was far from universal in the Constantinople Armenian press. The final part of Davidian’s lecture was dedicated to the yet unexplored representation of migrants in the work of the late nineteenth century Realist painters of Constantinople, focusing specifically on canvasses by Simon Hagopian, Bedros Srabian (1833-1898), and Garabed Nichanian (1861-1950). Davidian presented two paintings depicting migrant beggars: The Armenian Beggar from Van (1882) by Srabian, exhibited and well received at the prestigious ABC Club in Constantinople, depicting an elderly beggar with a direct gaze towards the viewer, asking for their compassion and another painting by Hagopian, Beggar Woman from Van (1889). Through a close comparative reading of the two works the speaker proposed insights into the perceptions of rural migrants from the Ottoman East by urban elites, but also into the wider social, economic and political environment of the period. By introducing noted Constantinople artist Garabed Nichanian’s now lost monumental painting Provincial Armenian Wedding in Moush (1890) into the discussion, Davidian marked sharp contrasts with the more commonplace images of migrants from Ottoman Armenia depicted as downtrodden hamals and helpless beggars. Yet he warned that not all was as it seemed in these paintings and invited a careful reading of the works, all representations of the provincial Armenian viewed through the prism of westernised urban intellectuals. A further work by Nichanian, The Letter Reading, depicting a provincial Armenian scene – set probably in Moush – in which a migrant’s letter is being read to his elderly illiterate parents demonstrated Nichanian’s and other artists’ continuous interest in the figure and experience of the migrant. In all the above seemingly Realist works Davidian invited the audience to consider the the uses and presence of allegory, and of strong Romantic undercurrents, often used to cloak meaning from Imperial censors. Davidian closed the lecture, with another painting by Hagopian, Portrait of a Hamal from Moush, a deeply psychological portrait of an elderly migrant. Davidian invited the audience to consider the painting while listening to two excerpts from contemporary published texts. The former was extracted from an article by Arpiarian, in which the writer discussed a friend’s reaction to a painting of a migrant by Srabian titled Manoug Aghpar during a visit to the artist’s atelier. The second excerpt came from the opening paragraph of Hrant’s first Letters of the Migrant, a text pregnant with symbolism where the author described an apple from the homeland with lyrical sensitivity, likening it to a migrant from Ottoman Armenia. A reception was held at the end of event which allowed guests and organisers from the Centre Arménien and the Programme of Armenian Studies to mingle and enjoy the rest of the occasion.